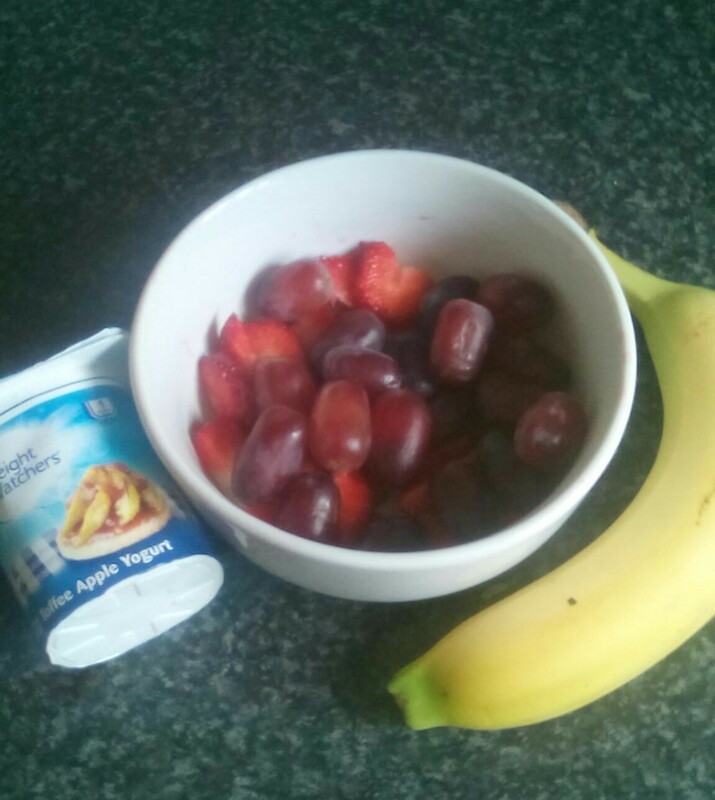 So I shall be posting my food diary every Wednesday as that’s my weigh in day. This week I’m weighing in on Friday as the legion is getting a new carpet fitted. So its D day for me tomorrow with my first weigh in! 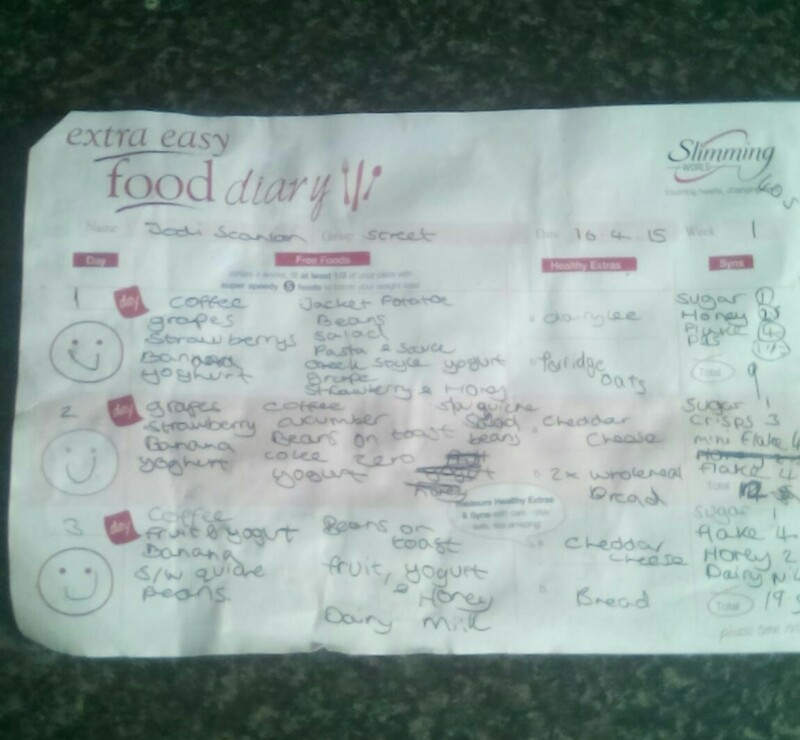 This is what the food diary looks like, you are asked to fill it in for your first 4 weeks as a member. You have to write it as you eat and absolutely everything that passes your lips must be recorded. Its a pretty good monitoring tool. It does end up a crusty, splashed and scribbled mess though hence why I will typing it out also. – 3 quarter cook the potatoes in the microwave and leave to cool. When completely cooled slice them with the skins on. Get a pyrex dish (or any medium sized dish) and spray with frylight. -Then lay the sliced potato across the bottom of the dish. Squash them down and fill in any gaps. Then cut the remainder of the potato slices in half and put the semi circles around the sides. This is your replacement pastry. Bake in the oven for 5-10 minutes to crisp a little ready for your mixture. -cook the pasta ‘n’ sauce in water. Then beat the eggs and add to the pasta when cooled. Now you can add all your over ingrediants in and season to your taste. – Top with your cheddar cheese and place in the oven at 190°/200° (adjusting to your oven) for 20 to 30 mins or until golden brown and crisp. My partner and children love this and its perfect to take on picnics or to someone’s get together that isn’t slimming world friendly. And its dirt cheap too! Overall I’m really happy with this weeks food and I’ve found that my appetite really decreased by the end of the week because I really focused on portion size. I feel less bloated and my skins looking loads better. I know It may seem repeatative and boring but that works for me. There isn’t a massive variety of foods I like. When it comes to vegetables I’m pretty much a carrots and peas girl, maybe a fleurette of broccoli if im Feeling adventurous (not the stalks though, they are dirty yuk). Meat I don’t really eat much but if I do I stick to pork and chicken. I hate eggs with a passion, cooked any possible way they make bile rise in my mouth. Fish and seafood is a total no go, tuna is the only fish I will eat. Salad for me consists of lettuce and cucumber and maybe some cress if I want it to look pretty. So you can probably tell why I keep my menu basic. For this to work for me I have to be satisfied by food I enjoy. Any bland recipes would be greatly appreciated though! I’ll see you next week for my next food diary and visit back to see if/ what I lose tomorrow!